When you are sitting at the bar, at one of the tables or on one of our comfortable couches, sipping Krakonoš, Litovel or Zubr beer, or choosing from our rich selection of mixed drinks, you will never be alone. There will always be somebody to have a chat with or to get to know a little bit better… And our friendly staff will be happy to offer you the best of our many special offers and play your favourite song to which you can also watch the video on our big screen plasma TV, be it the latest hits or golden oldies. And if you happen to be a bit sad, there will always be a shoulder to cry on. 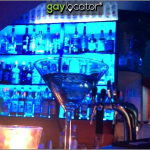 Come and let us convince you that the oldest gay club in Brno is not only a legend but still the best place for boys who like boys, girls who like girls, and for all who don’t care what they like but like each other and want to have a great time. We are not responsible for the changes to the opening hours.